The deep blue sea! Poseidon invites you to his realm of 10 lines and 5 reels. 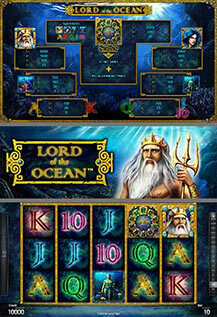 Follow the mermaid in this beautiful underwater game and open the gate to the legendary treasures of Greek mythology. SCATTER substitutes for all symbols except the scattered special expanding symbol of the Feature games. 3 or more SCATTER-SYMBOLS trigger 10 Feature games, and randomly reveal a special expanding symbol that expands to cover all three positions on the respective reel and pays on any position. Feature games can be re-triggered during the Feature games and are played at current bet.